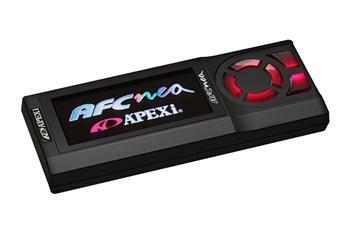 The AFC NEO Version 2 marks the newest edition to the world famous Super AFC line of piggy back fuel controllers. Building upon the powerful AFC Neo, the AFC NEO Version 2 has taken piggy back style fuel control to a new level. The AFC NEO Version 2 boasts an incredible 16 points of user definable fuel correction. VTEC control has also been incorporated for Honda/Acura applications. A complete monitor mode is also available to keep the driver/tuner informed of critical engine data, such as: RPM, throttle, battery voltage, correction , air flow, pressure (kpa), and karman sensors. The AFC NEO Version 2 is the industry standard for sub computer fuel control. The AFC NEO Version 2 is designed to fine tune and “squeeze” power out of existing engine setups by allowing the user to modify the fuel curve with precision accuracy. Since the act of simply bolting on performance products does not make horsepower, the AFC NEO Version 2 allows the user to calibrate the fuel system in accordance with performance upgrades as they are installed. The AFC NEO Version 2 modifies the air flow meter/ pressure sensor signal voltage going to the factory ECU (Engine Control Unit) to change the amount of fuel injected. The AFC NEO Version 2 utilizes a Color FED (Field Emission Display) to display critical data in three different modes. The AFC NEO Version 2, while not completely universal, comes pre-programmed with 28 of the most commonly used air flow meter (hotwire type), 21 pressure sensor (map sensor type), 8 air flow meter (flap type) sensor maps. By setting the AFC NEO Version 2 to one of these programs, the user is able to adjust injected fuel amounts by +/- 50%. 8 or 16 user defined RPM adjustment points allow maximum tuning in 500 rpm increments. Fuel can also be adjusted for part and full throttle situations. The Deceleration Air Flow Correction cures erratic idle problems for Hot Wire vehicles equipped with an open atmosphere blow off valve. The AFC NEO Version 2 can also display an incredible amount of data including: Air Flow Capacity (Hotwire and Flap Type only), Engine RPM, Throttle Position, Pressure Sensor voltage, Karman Frequency, and Air Flow Meter Correction. The AFC NEO Version 2 displays data in three different modes: Numerical, Analog, and Graph. Numerical Mode allows the user to monitor up to four different parameters in numbers and also shows peak hold values on demand. The Analog Mode displays up to two values in an easy to read meter style display. The Multi Mode displays up to two parameters in digital and one parameter in analog. Peak Hold is also included in this function. The Graph mode offers real time graph plotting with a Ghost map trace feature built in. The graph can replay movement up to 60 seconds.